Celeriac is one of my favorite vegetables. It’s at the market in the fall and I get very excited by the prospect of eating it. I usually make a purée together with potatoes and a bright green mix of fresh parsley and olive oil; This “green celeriac mash” is part of my traditional Thanksgiving menu, and, if all goes well, I will post the recipe in a few days. In the meantime, below is another great recipe that’s perfect for the freshest market-bought celeriac: Céleri rémoulade, a typical French celeriac salad. But here first is some information about this excellent vegetable which seems to be less well known in the United States. 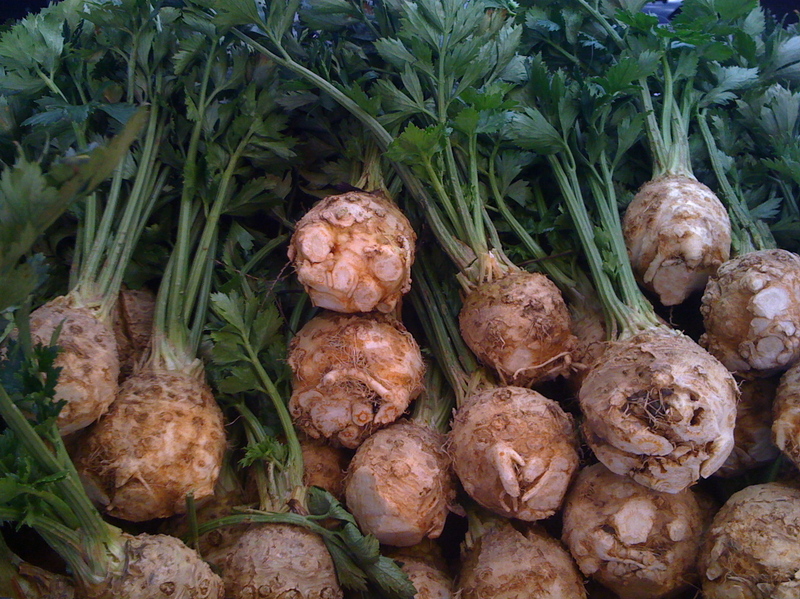 Celeriac, also known as celery root, is different from celery, though they are related. They evolved from the same wild plant, apium graveolens, which is common in Europe and temperate parts of Asia. Wild celery has tough stalks and a very strong flavor, and historically the stalks were used solely for medicinal purposes and as a condiment, though the small root came to be considered a delicacy in Europe and the Arab world. In the early seventeenth century, a milder, edible variety of stalk celery was cultivated, and botanists also began developing a plant with a larger root – celeriac. It’s important to pick out celeriac carefully, because the interior can be pithy and hollow, which makes for a bad surprise and can be very frustrating. (That’s why it’s a good idea to always buy a little more celeriac than one think one needs, just in case; that, and because a good half inch of the vegetable comes off when it is peeled.) So celeriac should feel heavy; if the stalks are attached they should not be wilted; and the root should be very fragrant. NOTE: Predictably, there are as many versions of this recipe as there are cookbooks. The variations in the dressing range from a mustard mayonnaise to a mustard cream sauce with no oil at all. I have tried the different versions and I must admit that, to my surprise, the recipes that mix mayonnaise and cream are the best. (I was certainly very skeptic at first, despite the fact that these versions appear in some of my most trusted references – Alice Waters and Thomas Keller). The recipe below follows the proportions prescribed in Chez Panisse Vegetables. To prepare the dressing, mix the lemon juice with salt and pepper, then stir in the mustard, mayonnaise, and finally cream. Peel the celeriac by removing a generous amount of the tough, knobby outer layer. Finely grate the root and immediately toss with a few tablespoons of dressing at a time, making sure not to overdress or the salad will become soggy. **Celeriac oxidizes quickly so it really must be dressed immediately. ** Taste and correct the seasoning for salt, pepper, and lemon juice. Most recipes suggest to cover and refrigerate the salad for anywhere from 15 minutes to half a day. I also like to eat it immediately, when the celeriac is still crunchy. Chop parsley and sprinkle over salad just before serving. This entry was posted on 18 November 2010 at 23:46 and is filed under At the market, Fall, Winter. You can follow any responses to this entry through the RSS 2.0 feed. You can skip to the end and leave a response. Pinging is currently not allowed.